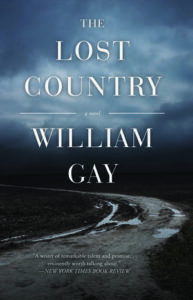 The Lost Country was published posthumously, ten years after author William Gay’s death. Fans of Gay’s work speculate when the text was composed, debating whether it fell toward the beginning or end of his career. They also wonder how the text was composed; with significant characters vanishing halfway through the book, replaced by ones of similar demeanors but different names, it’s uncertain if the book was originally written in its full form or as a series of drafts that were merged together to create a final product after his death. But despite the work’s unclear origin, the disjointed nature of the final product perfectly mirrors the emotional arc of its protagonist, Billy Edgewater. The Lost Country follows Edgewater’s failed journey to his father’s death bed, as Edgewater finds himself caught in a series of diversions that not only prevent the familial reunion, but ruthlessly explore the cycles of oppression that burden low-income American southerners. Edgewater’s journey starts as he stalks off into the wilderness on a self-directed journey to rejoin his ailing, estranged father. While a series of scarce flashbacks are scattered throughout the novel, they do little to paint a clear image of the emotional ties between Edgewater and his father. On the surface, this seems to reiterate Edgewater’s inability to emotionally connect with others. But on a deeper level, the absence of Edgewater’s father seems to make a larger comment on the illusive nature of his motivations. His mission to rejoin his father drives the story forward initially, but as the novel progresses, it is all but forgotten. Flashbacks to Edgewater’s upbringing continue to be scarce, suggesting that Edgewater’s personal motivations and drive are as vacant and hollow as his father’s legacy. The novel’s cast suffers from the same lack of emotional motivation as Edgewater; characters buy livestock and spark bar fights on bored whims, binge-drinking and hitchhiking under the flimsy guise of purpose. Edgewater never reaches his father, and by the end of the novel his original motivation is all but forgotten. Perhaps this is due to the nature of the posthumous novel’s composition. Regardless of Gay’s original intentions, the novel’s lack of a complete arc deftly explores the fractured nature of the American dream in the south. Edgewater’s inability to emotionally connect with others is consistent throughout the novel. Whether it’s the illusive memory of his father, his interchangeable roadside companions, or the many nameless women with whom he spends his nights, Edgewater fails to forge any meaningful relationships. At some points, he reveals frustration at his inability to connect or satisfy the needs of others. When spending the night with a stranger from one of the many roadside bars he frequents, his partner’s disapproving face reminds him of “faces out of his past” and he longs to “be in her favor, to impress her.” But he “could not find the words…and she did not want words anyway.” What she wanted was money, much like the majority of the novel’s cast; the characters struggle to survive through conning and thieving, yet always come up short financially and emotionally. Gay suggests that there is no space for connection within this fraught landscape – that survival and living are distinct from one another, and the latter cannot be accessed by lower-class southerners like Edgewater. Midway through the novel, Gay writes that “reality only touched Edgewater in places of transiency, jails and bus stations, the highway. Horizons and locks and timetables spawned in him a desperation, an aching need to be gone.” Edgewater never reaches his father because in a way, reuniting with his family was never his true intention. Perhaps Edgewater had no intention for his journey, other than the sake of the journey itself, or to find solace in temporary spaces. The other options – finality or infinite possibility – create his desperate need for determent, for the endless loops and patterns he finds himself in as he rotates in and out of jail, fights, schemes, and hitchhiking adventures. The Lost Country is a plotless, meandering piece, but these qualities mirror those of its protagonist. While we cannot be certain what Gay’s intentions were for the novel when he first drafted it, the result is a haunting and visceral rendering of the American south. Briana McDonald’s fiction has appeared in The Stonecoast Review, Glassworks Magazine, The Cardiff Review, Rozyln: Short Fiction by Women Writers, and Marathon Literary Review. She is an Associate Editor and a prose reader at The Literary Review.